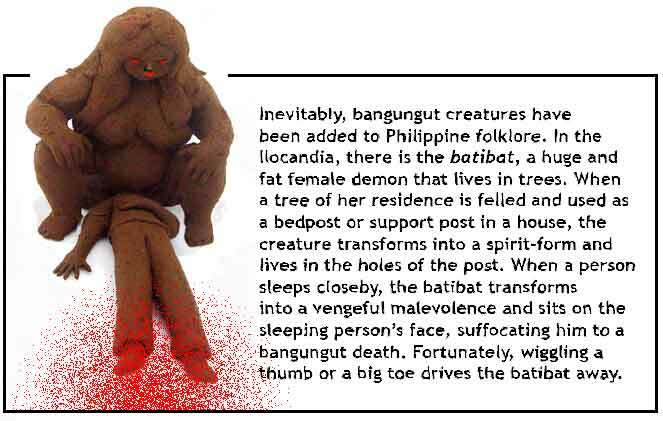 Bangungut / Bangungot/ SUDS: The Folklore and the Science by Dr Godofredo U. Stuart Jr.
We sleep to wake. . . but sometimes, sleep becomes brother to death. . . leads us helpless to a nightmare's dance. . . and we waken no more. To die in one's sleep. . . so basic to the cauldron of human fears, subject matter to ancient rhymes and holy sonnets, the arts and literature, laden with layers of mythology, coloring folklore with creatures of the night, concoctions of superstitions, and nostrums of nightmare preventions. Cloaked in mystery and dread, it has acquired a motley of names and acronyms – Sudden Unexplained Death Syndrome. SUDS, Sudden Unexpected Death in Sleep, Sudden Unexplained Nocturnal Death Syndrome, SUNDS, nightmare deaths, sudden night deaths – as science pokes through the muddle of myth and folklore, searching for etiologies and pathogenesis that can shed light into this mysterious fatal affliction that visits presumably healthy young men in their sleep, more commonly in the Southeast Asian and Pacific Rim countries and Polynesian populations believed to have migrated from South East Asia centuries ago. First reported in the Philippines in 1917, 'sudden night deaths' or SUDS (sudden Unexpected Death in Sleep) has been attributed to bangungot (bangungut - from the Tagalog root words of "bangon" (to rise) and "ungol" (to moan). It is a syndrome wrapped in folklore and myth, that consists of a nightmare, commonly occurring in nocturnal sleep, frequently after a heavy meal that is often accompanied by alcohol, most often in young males, aged 25-44, presumably healthy, without any known cardiac illness.
. In the Philippines, bangungut (SUDS) has been so linked to gluttonous eating and bacchanalian drinking, to the exclusion of other symptoms or warning signs. Fainting and family history do not raise red flags. But South East Asian studies suggest that a history of fainting with a positive family history increases the chance of dying of SUDS in the next five years. A review of SUDS cases (Munger and Booton) from Death Certificates filed in Manila during 1948-1982 showed the same characteristics: 96% male, mean age 33 years, modal time of death 3:00 a.m. The deaths were seasonal, peaking in December-January, and the SUDS victims were more likely than diseased controls to have been born outside of the Manila area. A 2003 UP health survey on SUDS among young Filipinos reported 43 deaths per 100,000 annually. How often bangungut becomes fatal is unknown. Many cases are never reported, especially in the rural areas where dying in your sleep is an accepted event in the folklore of death. Many know others who died in their sleep. Many more are 'survivors' of one or more attacks, with descriptive details of bangungot -type nightmares– of sleep paralysis, of falling from a mountain or into a deep abyss, of the creature in the dark standing by the bedside. How many of these are actually near-death or near-bangungut experiences or are they merely generic ingredients to culture-flavored nightmares? Note: I have to begrudge the Ilocandia myth makers. Why the need to invent "Batibat?" To die in a bangungut nightmare is uugghh-dreadful enough. But to die with the the fat and vengeful "batibat" seating on your face. Oh, mercy me. Although there are witness reports of "moaning, groaning, gasping, choking, frothing, and labored breathing," as often, patients are found dead, in seeming peaceful slumber, without the sounds of terror or any evidence of a terminal struggle. In a "macho-culture" with a penchant for drinking, often to oblivion, and accompanying this libatory indulgence with a smorgasbord of "pulutan," pancreatitis became the popular and preferred "point-to diagnosis." (see pancreatitis, below). In a country with more than 7000 islands and more than 70 indigenous communities, where albularyos and medicos minister to the end-days, diagnosing fainting spells by tawas and treating them with a bulong and/or orasyon, where the night worlds are ruled by the frightful creatures of myths and superstitions – the tikbalangs, kapres, asuwangs, white ladies and pontianaks, where death's ways are accepted with funereal fatalism as God's will, karma, or bangungut. — alas, the true incidence of bangungut / SUDS is probably a-long-time-coming before it gets revealed to the scrutiny of science. Of course, nightmares are as old as sleep itself, and sleep-deaths are not unique to one particular race. Cultures wrap it in their own mythologies and superstitions. There are reports of SADS in other countries, unrelated to Southeast Asian populations. However, it was the Southeast Asian cultures and migrant populations that originally provided the mystique and attention to the nightmare-death syndrome. Hmong of Vietnam, TSOB TSUANG - the 1970s, the U.S. coined the acronym SUND (sudden unexpected nocturnal death) and SUDS (sudden unexpected death syndrome) from reports of 38 mysterious deaths among Southeast Asian refugees, mainly from the Hmong of Vietnam. A case control study in the Ban Vinai refugee camp in northeaster Thailand revealed associations between sudden death in sleep and membership in the Green-Hmong subgroup with a family history of sudden death and non-fatal sleep disturbances. French Polynesia, SUDS cases attributed to Polynesian migration history from South East Asia centuries ago. In a study of 150 men with a history of fainting, cardiac arrest, or an abnormal EKG. Of these, 32 were found to have the abnormal EKG pattern; in 6 of 11, ventricular fibrillation could be induced. 70 % had an older male relative who died unexpectedly in the night. Japan, POKKURI — a SUDS misnomer, neither "sudden or unexpected," a ritual of the elderly Japanese who go on a winter pilgrimage to the pokkuri-dera (Buddhist temple of sudden death, the Kichi-denji Temple in Nara City). Not wishing to suffer or be a burden with an extended illness, they actually pray for a discrete and peaceful death while sleeping, to 'pokkuri,' to just "pop-off." • In the 1980s, Lancet reported SUDS deaths among Thai construction workers in Singapore. • Sporadic reports of deaths among Cambodians and Laotian men in North America and refugee camps in Thailand. • A 2006 UPS report in England of SADS being about eight times higher than previously thought. Aged 4 to 64, none had a history of heart disease, almost one in five had a family history of sudden unexplained deaths before the age of 45. Death was suspected to be from a genetic heart defect causing malignant abnormalities in heart rhythm. Sleep paralysis is not unique to the bangungut syndrome. It is a common and ancient sleeping disorder attributed to demons and malevolent spirits, characterized by a feeling of immobility, being pinned down by an invisible force, unable to move and unable to scream for help. Inevitably, it becomes embellished with the creatures of culture and superstition. (See Batibat, above). Sleep paralysis usually occurs at the threshold of wakefulness and sleep, hypnagogic when one is falling asleep, hypnopompic when one is waking up, with the accompaniments of falling sensation, chest pressure, and presences of shadowy creatures. Dreaming occurs chiefly in REM states, to a lesser extent in NREM sleep. Sleep is cyclic with 4 or 5 REM periods during the night accounting for one-fourth of the total hour of sleep ( 1 1/2 to 2 hours). Studies suggest alcohol disturbs the REM cycles of sleep. What effects on the REM dreams? What effects on the stage 3 or 4 when sleep terrors (pavor nocturnus) occur? Nightmares occur during REM sleep. Sleep terrors in stage 3 and 4 sleep. Night hag, or a waking dream, a modern-day name given to a sleep associated with nightmares and sleep paralysis. It is believed to be a nightmarish dream-state in the threshold of sleep and waking, sometimes replete with ogres and creatures, holding the person down or paralyzing him in fear. Some survive these episodes with "marks and bruises," attributing the experience to the paranormal. The occurrence of SUDS in Asian populations, the decline among SEA refugees after immigration to the US, the elevated risk among migrants in Manila and seasonality of occurrence (Munger and Booton) implicates stress, environmental factors and nutritional deficiencies. Of the Thai workers in Singapore, nutritional deficiencies were implicated, particularly thiamine and potassium. However, there is no information as to whether potassium levels were obtained, or how severe the hypokalemia was. Stress has been considered in the etiology of SUDS, reported in usually high numbers in healthy young Southeast Asian men, especially in various refugee populations and migrants communities. With increasing length of residence in the US, SUDS rates markedly declined. But if stress alone is causative, how to explain its relative absence in the many other countries ravaged by war and poverty, and driven to dispersions and economic diasporas. Besides gorging and drinking before bedtime, certain foods myths abound. Some warn against big noodle meals before bedtime. Too, rice cakes at bedtime. In one rural village, seasoned imbibers are afraid to combine beer and balut, from an anecdotal account of a father and two sons who succumbed to bangungut deaths - the deadly combination, prologue to their dreadful end. • Drinking several glasses of water before sleeping. • Lying on the left side. • Not going to bed too soon after a big meal (especially one washed down with lots of alcohol). • Avoid balut as pulutan when drinking beer. • Put on lipstick, paint the nails, or wear women's nightclothes to bed at night to fool the pontianak, the lady ghoul. Inevitably, science went forging and fishing into the sea of folklore and myths. In the recent decades, battling through ghouls and night hags, armed with the old and new tools of technology and the disciplines of research, digging into new world of genetic mutations, it has emerged partially victorious, providing us alternatives to the old and overused pancreatitis-diagnosis, with new theories and etiologies — the Why-What-and-How of unexpected sudden nocturnal deaths, and further adding to its lengthening lists of acronyms and syndromes (SADS: Sudden Arrhythmia Death Syndrome from Brugada, the Long QT, or Short QT syndromes). In the Philippines, the cause of SUDS / bangungut has been linked to acute hemorrhagic pancreatitis attributed to a hearty or gluttonous meal often downed by a hefty amount of alcohol. A high salt diet, contributed to by native condiments - patis and bagoong - has been implicated. Stories are told of bangungut attacks with the combined indulgence of beer and balut. As the sole cause of bangungut, pancreatitis is a hard-sell. Usually, acute pancreatis associated with excessive alcohol use, is rarely, if ever "silent," but rather quite dramatic and severe in its presentation, more likely to present itself with more than an "ungol" (groan). PANCREATITIS is the inflammation of the pancreas, the gland that sits behind the stomach, concerned with digestive enzyme functions and production of insulin. It is connected by a ductal system to the liver and the gallbladder, an anatomic detail of concern in gallstone disease. Pancreatitis can be either acute or chronic. In acute pancreatitis, there may be a history of excessive alcohol intake or a heavy meal preceding the attack or a history of biliary colic (gallstones) in the past. The rest are due to infections, vasculitis, drugs, trauma, hypercalcemia, hypertriglyceridemia. Although occasionally mild, often the symptomatology is rather dramatic in acute pancreatitis, with nausea, vomiting, fever, abdominal pain, distention, sweating, rapid pulse,and shock. Clinically, it is a hard-sell of a diagnosis if it is to be solely implicated for cause of bangungut deaths. As mentioned, attacks of acute pancreatitis have a rather dramatic constellation of symptoms, running the course of hours to days, with a severity that forces the patient to seek help or medical attention. Of course, the pancreatitis could have been "silent" if the alcohol was used in 'overdose' amounts, enough to cause respiratory depression, seizures, shock, coma, and death. Still, it will not explain the many cases of "bangungut" deaths in the seemingly "peaceful" scenarios of dying. Also, there are many similar "night deaths" where autopsies failed to show any pathologic cause. And for these, the usual fall-back is the waste-basket diagnosis of "cardio-respiratory arrest." The human body has a system of quasi independent electrical circuits that can be recorded through medically dedicated tools: the EMG-NCS (electromyography for muscle and nerve conduction studies), the EEG (electroencephalography for the study of brain waves) and the EKG or ECG (electrocardiography for a print out of the heart's electrical rhythm). Fascinating, all – electrical systems working in unison, with an endogenous power source that usually lasts a "lifetime of average use and abuse." Of these, it is the EKG that can provide information critical to the immediate assessment and management of life-and-death situations: heart attacks and potentially fatal cardiac irregularities. To boot, it can provide clues of rhythm disturbances and PQRST-wave configuration abnormalities that can alert the astute clinicians into raising red-flags, recognizing and preventing potential problems. The ECG has been the gateway tool in the diagnoses of clinical entities constituting a group called SADS (sudden arrhythmia death syndrome) recognizable by its potentially fatal electrocardiographic presentations (Wolff-Parkinson-White syndrome, idiopathic ventricular fibrillation, or arrhythmias caused by electrolyte imbalances). Recent studies and discoveries have focused on emerging entities — the Brugada syndrome, the long-QT and the short-QT syndromes — with its hereditary genetic defects affecting the cardiac ion channels, stripping some layers from the myths of sudden unexpected nocturnal deaths, providing science, etiologies and treatment options. 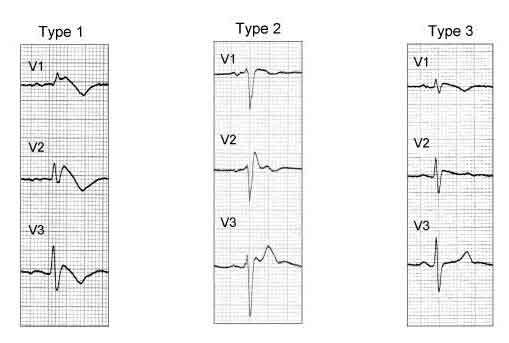 The V1– V3 tracings compare the normal on the left with the Brugada pattern on the right: a terminal R' wave in lead V1, a convex curve or "coved-type" ST elevation in V1 and V2 and a saddle-shaped ST-segment elevation in V3. In 1998, a hereditary (autosomal dominant) gene defect was found, involved in the coding of protein components in the sodium channels in heart cells. The channel defect causes abnormal electrical conduction in the heart with resultant ventricular arrhythmias, including full-blown ventricular fibrillation leading to death. Of the patients studied, many presented with unexplained fainting spells. The Brugada syndrome presents with 3 different ECG patterns. The classic type 1 Brugada pattern consists of a right bundle branch block with a right precordial injury pattern (ST-segment elevations that descend and have an upward T-wave inversion ("coved type") in leads V1 through V3). Types 2 and 3 have "saddle-back" ST-T waves, with descending ST segments and an upright T wave; in type 2, the T wave is upright or biphasic. A slight prolongation of the QT interval may be noted in the right precordial leads due to the prolongation of the action potential in the right ventricular epicardium. The Brugada patterns differentiate from typical RBBB patterns by the absence of widened S waves. The classic (type 1) Brugada syndrome presents with the coved-type ST elevation in more than 1 right precordial lead ,V1 through V3, with or without a sodium channel blocker, with one of the following criteria: syncope, documented ventricular fibrillation, electrophysiologic inducibility of ventricular tachycardia, positive family history of cardiac death younger than age 45, nocturnal agonal respiration, self-terminating polymorphic ventricular tachycardia, and type 1 ST elevation in family members. ECG patterns in Brugada syndrome. According to recent consensus document, type 1 ST segment elevation either spontaneously present or induced with Ajmaline/Flecainide test is considered diagnostic. Type 1 and 2 may lead to suspicion but drug challenge is required for diagnosis. The ECGs in the right and left panels are from the same patient before (right panel, type 1) and after (left panel, type 1) endovenous administration of 1 mg/kg of Ajmaline during 10 minutes. A case report decribed a patient with Brugada syndrome with VF (ventricular fibrillation) episodes consistently related to alcohol consumption. (EP Case Report: Watanabe et al. Types 2 or type 3 Brugada syndrome presents with ST elevations: ≥1mm in type 2 and <1 mm in type 1 in more than one precordial lead, with conversion to type 1 Brugada ECG patters after the administration of a sodium channel blocker plus one of the type 1 criteria. Fortunately, these ECG patters are rare. In Japan, it is found in less than 1% of the population; and in the U.S.,in less than 0.5%. Of these, most will not have any problems. But the EKG pattern, coupled with a history of unexplained fainting, a history of a relative dying young, raises a red-flag risk of sudden death. In Thailand, where the estimated prevalence of SUDS is 26-38 per 100,000 population, a study on patients with the Brugada syndrome showed a low heart rate variability at night that may predispose to the occurrence of ventricular fibrillation episodes. A study done to evaluate the significance of cardiac autonomic neuropathy (CAN) in the Brugada Syndrome concluded that CAN is an important risk factor in BS, and that men are susceptible to the development of cardiac events. The prognosis for high risk patients - abnormal EKG with history of syncopal attacks or near-sudden death resuscitation - is very poor, with a third at risk of a polymorphic ventricular tachycardia within two years. • Although rare in children and generally excluded from the Brugada debate, there was a report of 30 children and adolescents (≤16 years of age) diagnosed with the syndrome. 37% had Brugada-type EKG (1 cardiac arrest, 10 syncope) and the majority (60%) were asymptomatic. The children differed from adults in gender distribution - there was no obvious male predominance. Although it is genetic disorder of autosomal-dominant inheritance, with males and females expected to inherit the gene equally, in adults, aged 34 to 53, it manifests invariably male, ≥90%. The hormonal landscape attempts to explain the differences: the male testosterone might reduce inward calcium currents and facilitate onset of arrhythmia by shortening of action potential while female estradiol could be "antiarrhythmic" by modulating calcium current density. The hormonal changes in puberty and their electrophysiological effects may partly explain the increase of male occurrence after puberty. • ICD (Implantable cardioverter defibrillator): At present, implantation of an automatic ICD (implantable cardioverter defibrillator) is the only treatment proven effective in treating ventricular tachycardia and fibrillation and preventing sudden cardiac death in patients with the Brugada syndrome. Risks for asymptomatic patients with typical electrocardiographic patterns are the same; a third will develop ventricular tachycardia or fibrillation within two years. • Patients with Brugada syndrome and a history of cardiac arrest must be treatment with an ICD. • Studies have suggested that asymptomatic patients with no family history of sudden death can be managed conservatively with close follow up without an ICD. • However, another study suggested that inducible ventricular fibrillation in asymptomatic patients is an indication for ICD implantation, with the data from a single large study showing a 12% risk of spontaneous VF within 3 years of diagnosis. • Activity Restriction: Because regular physical activity can increase vagal tone and increase the likelihood of ventricular fibrillation and sudden death, patients diagnosed with Brugada syndrome should be advised against competitive sports. Like the Brugada syndrome, with its characteristic hereditary ion channel and ECG abnormality, hereditary prolongation of the QT interval is also associated with SADS (Sudden Arrhythmia Death Syndrome). LQTS is caused by mutations of the genes for cardiac potassium and sodium ion channels. The most common type is the autosomal dominant Romano-Ward syndrome. While it can present with syncope and seizures, In 30 to 40 percent of patients, sudden death is the only event. While the cardiac events are usually precipitated by physical and emotional stress, deaths can also occur in sleep. A history of unexplained sudden death in a young family member is a clue. QT prolongation is characteristic and predisposes to ventricular tachyarrhythmia – polymorphic ventricular tachycardia, or torsade de pointes, which can lead to ventricular fibrillation and sudden cardiac deaths. Sometimes, only a borderline prolonged QT interval is seen. 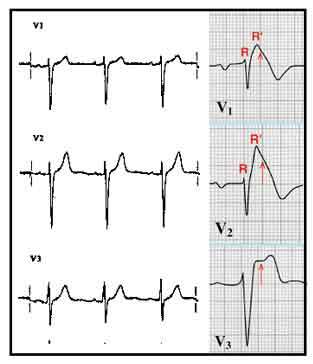 Another clue is the presence of T-wave alternans, the severity of which correlates with cardiac events. Some of the highest rates of inherited long QT syndrome occurs in Southeast Asian and Pacific Rim countries. The syndrome has more treatment options than the Brugada syndrome: Beta blockers, potassium, avoidance of certain drugs, permanent pacemakers, and implantable defibrillators. A relatively new syndrome, first described in 1999, belonging to the ion-channel disorders called "channelopathies," hereditary short QT syndrome is an autosomal-dominant clinical-electrocardiographic entity with associated gene mutations. It is characterized by a short QT, frequently tall-peaked T-waves similar to a "hyperkalemic-T," inducible ventricular fibrillation, episodes of syncope, a high tendency for paroxysmal atrial fibrillation or life-threatening arrhythmias, without any underlying structural heart disease. Three forms of the syndrome have been identified affecting different channels. Indicated therapy for those who have survived a cardiac arrest or those with a history of syncope, is the implantable cardioverter-defibrillator. In its absence or inaccessibility, drug therapy has the potential for prolonging the QT interval. However, drug therapy has been shown to be beneficial only for the first form, and ineffective for the other forms. Although it has been linked to deaths in infants, children and young adults with a family background history of sudden cardiac death, it is possible that many survive into a later adulthood, into the mean age of deaths linked to SUDS/ SUNDS or bangungut. In the past three decades, science has made incredible head ways into unraveling the mysteries of unexpected sleep-deaths. Some sleep-deaths are now preventable. It might prove to be that many of these unexplained nocturnal deaths are attributable to genetic aberrations that cause the heart's electrical system to go haywire. To search out these cohorts of patients who could benefit from the science is a formidable task. For many in the remote boondocks and rural areas, their night world will continue to be ruled by their myths, superstitions and folklore, their fears assuaged by nail polish, lipstick, and doses of bedtime prayers. (18) • Sudden Arrhythmia Death Syndrome: Importance of the Long QT Syndrome. / John Meyer et al / Am Fam Physician. 2003 Aug 1;68(3):483-488.